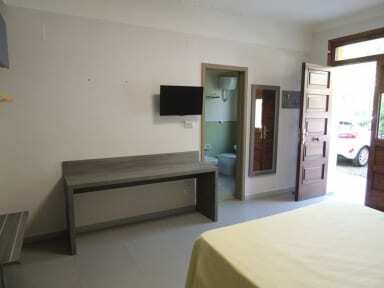 Hostel room was simple but perfect. Plenty of space with bed, dresser, bath, tv and air conditioning. My daughter and I needed a place while visiting the Pompeii ruins and this was great. Just a few steps from the entrance and also had lunch at the restaurant and enjoyed that too. Good value for the price and would recommend to friends. Great for a one to two night stay, no wifi in the rooms but great location for the Pompei ruins and really enjoyed our stay! We had a private two room bedroom which was really nice. The location is literally right next to the ruins of Pompeii and couldn't be better. I can't really comment on the atmosphere since I literally got in at night and then left in the morning to visit the ruins. However, they held our bags for free which was nice and convenient. The only thing that was a little meh, was talking to the staff it seemed like we were put on the back burner, but that could have just been my perception. This place was fantastic totally not what we thought but it definitely exceeded our expectations, we didn't stay in the camping though. The room was lovely especially after being in hostels for weeks it was luxury. Located right next to the ruins and train that travels along the coast. 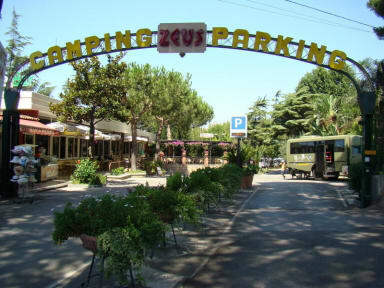 I would highly recommend to anyone staying in Pompeii and wanted somewhere affordable, comfortable and close to Sorrento. Since our last stay 3 years ago, the wooden chalets are being demolished and we stayed in a brand new apartment block, air conditioned, fridge, TV but only Italian channels, french doors to a balcony outside, really great place still with citrus trees everywhere. So handy next to the train station, the buses to Vesuvius etc and the Pompeii ruins. There is a Carrefours just 10 mins, Pompeii centre 30 mins walk, but the nearest decent restaurant, Hostaria Plinio, just 15 mins, highly recommended. The room was clean and spacious. Right near the ruins and ticket booth for tours. Wifi was ok, sometimes cut out alot other times worked well. Make sure you check the train station you're getting off at (directions on site for nearest station, other station about 20-30 min walk), but otherwise fairly easy to find. Simple hotel room. Perfect location to see Pompei. No atmosphere for solo travellers. Everything around closes when Pompei does but you can walk 10mins onto Pompei town. Rooms were adequate, though they REEK of cigarette smoke. Wifi was laughable - only place I could get a signal was a spot in the parking lot and even that was touch and go. Location is ideal for getting to and from the ruins quickly, though. Clean room. Heater didn’t work too well. Water was hot tho. Location is a little weird.